Reservations are accepted 7 days a week. Note: Friday & Saturday we may decline reservations depending on expected level of business. We will contact you if there are any issues with your booking. TapRoom is always looking for great people to join our team! Must be a hardworking individual that enjoys a fast paced environment. Must take direction well, be detail oriented, and a team player. A love for craft beer, food, and/or customer service a must. If you have a passion for creating an memorable guest experience, join the TapRoom team! Let us host your fundraiser! We will donate 20% of sales (both food & drinks) from each ticket to your organization while drawing awareness of your cause. The charity will have the venue for the night to promote their organization and what they are all about. Our regular customers will be exposed to your charity, and you should take advantage of this by promoting your organization / cause to all the friendly new faces. Please note: we request that you do not solicit to customers while they walk in the restaurant or as they are sitting down at their table. You will have a designated table to display any promotional material but please let the customers come to you. We’ve have had many complaints people feeling solicited so please respect this policy. The promotion should be a joint effort between the TapRoom and the organization. We can create the flyer and distribute to throughout various means (ie. website) to our customers, and the organization should do what they can to promote the event as well. The more people that show up, the more money will be donated to the cause. Banners may be placed inside the restaurant as well as out front to display. Feel free to bring in any promotional material that you have. Graphic design dept. to create & print flyers. We decide on a date (Mondays, Tuesdays, Wednesdays, possibly Thursdays all work) that works for both parties. The flyer is made (by you or us) and both parties start promoting. Customers bring in the printed flyer (or mention that they are here for the fundraiser). We have a successful event and raise money for your organization! 75 people, average ticket $15, $1,125 sales for 20% donation of $225, you get the picture. Thank you for allowing us to host your organization and support your cause. 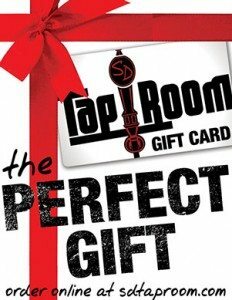 Gift Cards will be shipped to the address you specify at checkout. If you have any questions please email: info@sdtaproom.com – Thank you!